New-age cyber-attacks are more advanced, robust, and impudent and varied in nature and mode of the outbreak. Organizations are always susceptible to the intellectual property theft as existing legacy security solutions are proving to be inadequate and obsolete in the light of a new wave of cyber-attacks. The continuously increasing demand for expertise in cybersecurity put forth newer and difficult challenges in bringing up integrated solutions to the problems. The need is growing for a flexible, fast solution, based on the proven Security Operations Center (SOC) model, providing end-to-end managed services to meet rapidly evolving security challenges. 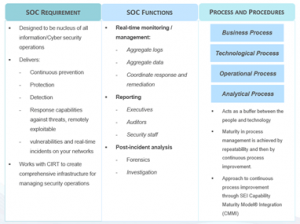 What is the role of Security Operations Centers (SOC) in Cybersecurity? A security operations center (SOC) can be a team working round the clock or a dedicated functional facility organized to detect, assess, prevent, and respond to any cybersecurity threat or incident. A SOC is required to fulfill and assess regulatory compliance. Though not unheard of, internal security operational capabilities are mostly limited and to build an internal SOC is costly and need time-consuming efforts. Also, internal SOC requires ongoing attention to be effective. Therefore, many large and even medium-sized organizations opt for options of having a third-party managed security service. In addition to the six models above, where the customer’s internal security teams are involved in varying degrees, there is another “fully outsourced” model. In fully outsourced models, a service provider builds and operates the SOC with minimal (or at best, supervisory) involvement from the customer organization. Any combination of these different types can be used in any organization based on the requirement of prevention and mitigation for cyber-attacks. Also, the function can be outsourced completely. Where a service provider shapes and operates the SOC with minimal involvement from the client organization. The strategic business impact of a SOC makes it a critical initiative for organizations. Organizations are building internal security operations capabilities because they want more control over their security monitoring and response process and also to have more informed conversations with regulators. Let’s understand the actual requirements for SOC from the organizational point of view. Every organization needs complete control over the organization’s security monitoring and response process. Frequent and informed communications with the regulatory bodies build confidence and response to the uncertainties becomes less surprising. A roadmap for response planning can be ready in advance to avoid last minute chaos leading to business issues. SOC becomes a must and critical for organizations due to its direct business impact. In case the organization decides to build the in-house SOC capability due to any reason or a vendor is involved at any stage, following recommendations are useful during the complete process of analyzing the requirement, building competencies, making an assessment, planning response, and finally taking preventive or curative actions. Enable buyers to plan budgets for SOC projects by aligning pricing and service catalogs to buyer maturity with the ultimate objective of growing SOC maturity for the buyer in a structured manner. Gain a competitive edge by focusing on industry-specific use cases for SOCs and helping customers evolve SOC metrics that are unique to their organization. Focus on aligning SOC deliverables with business objectives by developing tightly defined goals and metrics that the SOC needs to deliver against. Consider use of MSSP services to offset the cost of 24/7 SOC operations and to fill coverage gaps. Develop a SOC staff retention strategy from the outset. Reduced risks exposure in the ever-changing security threat environment. Information related to events, vulnerabilities, threats is available in real time to propose and perform actions. Cyber-intelligence is available for real-time situational awareness. A Managed SOC needs few requirements to fulfill to be more robust and create an attack-immune protected environment in which organization can function without being burdened with the challenge of monitoring and controlling cyber threats. These efforts need to be focused on using the following guidelines. Training: Experts teams need to continuously upgrade for their knowledge and skills to remain robust in the fast-changing cyber environment. The training needs to be focused on the latest network security equipment, security updates, the latest attacks, hacks, and so on. While the vendor organization can manage the training of their staff, internally-managed SOC needs to be trained within the organization or the training cab outsourced. Reporting: Real-time, integrated, action-oriented intelligence is useful for decision makers to control the situations with preventive and corrective actions. The decision makers may involve security analysts, systems engineers, or cyber-experts to analyze the state and suggest improvements in the organizational security. External managed SOCs focus on the business value delivered to organizations by providing monitoring and control support in real-time to save client’s critical business data. These vendors may also enable buyers to plan the budgets for SOC projects to increase the SOC maturity in a structured manner. These managed SOC providers get the competitive edge due to the industry-specific use cases for SOCs. They can, therefore, help customers advance SOC metrics customized and probably unique to their organization.